Because osteosarcoma is a deadly form of cancer, no absolute contraindications for treatment exist. Relative contraindications would include situations in which the patient is so frail that the risks of general anesthesia outweigh any potential benefits of surgery. Another relative contraindication would be a situation in which the patient has extensive, overwhelming metastatic disease, and the benefits of comfort or hospice care outweigh the potential benefits of surgical intervention. The genetic roots of cancer are irrefutable, and gene-focused basic science research holds tremendous promise for risk stratification, as well as for effective and innovative treatments. Multidrug-resistant varieties of osteosarcoma are a case in point. These cell lines have been shown to be genetically encoded with a certain membrane-bound glycoprotein that helps render these cancer cells "immune" to many chemotherapeutic agents. Early identification of such patients (perhaps at initial biopsy) would allow a tailored approach to neoadjuvant chemotherapy. Metastatic or locally recurrent osteosarcoma presents an especially tough treatment challenge that remains incompletely answered. Patients in such cases find themselves in a particularly poor survival bracket. Future efforts must be aimed at improving chemotherapeutic and surgical treatments that can be offered to these patients. One potential example of this is the bone-seeking radioisotope samarium (153-samarium ethylene diamine tetramethylene phosphonate), which has the potential to selectively deliver high doses of radiation to osteosarcoma cells. The safety and efficacy of this agent are being studied in patients with metastatic and locally recurrent osteosarcoma. Guidelines for treatment of osteosarcoma have been developed by the National Comprehensive Cancer Network (NCCN)  and jointly by the European Society for Medical Oncology (ESMO), the European Reference Network for Paediatric Cancers (PaedCan), and the European Network for Rare Adult Solid Cancer (EURACAN). (See Guidelines.) For further information, see Bone Sarcoma Guidelines. So-called neoadjuvant (preoperative) chemotherapy has been found not only to facilitate subsequent surgical removal by causing tumor shrinkage but also to provide oncologists with an important risk parameter. Patients in whom there has been a good histopathologic response to neoadjuvant chemotherapy (>95% tumor cell kill or necrosis) have a better prognosis than those whose tumors do not respond as favorably. Thus, future chemotherapy trials will incorporate adjuvant tumor cell kill to provide risk-adapted treatment regimens. Patients receiving methotrexate should not be given folate supplementation or trimethoprim-sulfamethoxazole, both of which interfere with the effects of methotrexate. Otherwise, the patient's diet is not restricted. Xiao et al conducted a literary review intended to shed light on the clinical outcomes of various chemotherapy regimens in the treatment of metastatic, relapsed, and refractory osteosarcoma. They concluded that a chemotherapy regimen comprising both a cell cycle–specific drug and a cell cycle–nonspecific drug could increase response rates. Xiao et al found that for three-drug regimens, adding a cell cycle–specific drug to ifosfamide-etoposide therapy may result in a better response rate than adding a cell cycle–nonspecific drug or any other two-drug regimen among those in their study. For patients with metastatic, relapsed, and refractory osteosarcoma, they recommended the use of second-line chemotherapy that is based on the combined ifosfamide-etoposide regimen. In the EURAMOS-1 trial, a randomized controlled study designed to investigate whether intensified postoperative chemotherapy for patients with newly diagnosed high-grade osteosarcoma whose tumor responded poorly to preoperative chemotherapy improved event-free survival, Marina et al compared a postoperative MAP (cisplatin, doxorubicin, methotrexate) regimen (n = 310) with a regimen in which ifosfamide and etoposide were added to MAP (MAPIE; n = 308). The primary outcome measure was event-free survival in the intent-to-treat population. At a median follow-up of 62.1 months, 307 event-free survival events were reported (153 in the MAP group vs 154 in the MAPIE group), and there were 193 deaths (101 in the MAP group vs 92 in the MAPIE group). Event-free survival did not differ between treatment groups. The most common grade 3-4 adverse events were neutropenia, thrombocytopenia, and febrile neutropenia without documented infection. MAPIE was associated with more frequent grade 4 nonhematologic toxicity than MAP was. The study results results did not support the addition of ifosfamide and etoposide to postoperative chemotherapy in this setting. 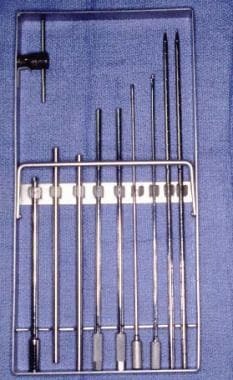 Incisional biopsy and core-needle biopsy (Craig needle biopsy; see the images below) are the most common types of biopsies performed by orthopedic surgeons. Open lines of communication between the orthopedic surgeon and the pathologist are vital to help ensure that adequate tissue is obtained for diagnostic purposes. The incision for an open biopsy must be carefully planned so as to avoid tumor contamination of the neurovascular structures and to facilitate removal of the biopsy tract en bloc during definitive surgery (see the image below). 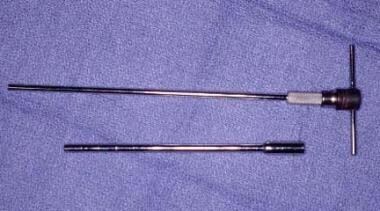 Regardless of the technique employed, a frozen section should be examined to confirm that the tumor has been sampled accurately. 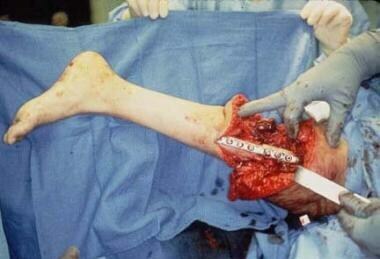 If possible, extraosseous components should be sampled rather than bone to lessen the risk of fracture. Seal bone holes with Gelfoam or a similar material to decrease the risk of hematoma and tumor spread. Drains should be of the closed-suction variety, and they should be placed directly in line with the skin incision (a short distance away). The primary aim of definitive resection is patient survival. Accordingly, margins on all sides of the tumor must contain normal tissue (wide margin). Wide resection is the goal for patients in whom primary tumor resection is contemplated. Simply defined, wide resection means that the entire malignant tumor has been surgically excised and that there is no remaining microscopic evidence of tumor cells at the resection margins (ie, that the margins are negative). Over the years, many authors have suggested varying and arbitrary amounts of the normal tissue cuff to remove along with the primary tumor to increase the likelihood of negative margins. There is no universally accepted definition of the appropriate thickness of the normal cuff. Technically, a wide margin still exists even if the distance between normal tissue and tumor is onle one cell thick. 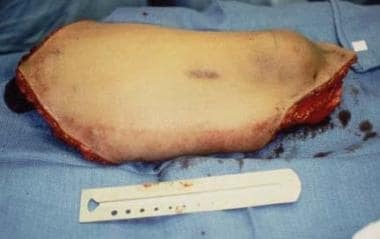 Oncologically, the width achieved is less important (limb-sparing surgery vs amputation) than the achievement of a negative margin. In other words, a limb-sparing surgery without wide margins could do the patient less of a service than an amputation with wide margins. This would apply in most cases where maximal preservation of life is the primary goal. Radical margins, defined as removal of the entire involved compartment (bone, joint to joint; muscle, origin to insertion), are usually not required for cure. A less-than-wide margin (marginal or intralesional margin) may be functionally helpful as a debulking therapy, but intrinsically, it will not be locally curative. Amputation may be the treatment of choice in some circumstances. Autologous bone grafts may be vascularized or nonvascularized. Rejection does not occur with these grafts, and the rate of infection is low. The growth plates of patients who are skeletally immature may limit options for stable bone fixation (osteosynthesis). With allografts, graft healing and infection can be problematic, particularly during chemotherapy. Immunologic rejection can also occur. Allograft-prosthesis composites are also an option. Prosthetic joint reconstruction can be solitary or expandable, though it is usually expensive. The longevity of such implants is a major concern in young children. Rotationplasty (see the images below) is particularly suitable for patients with distal femur and proximal tibia tumors, particularly large tumors in which a high amputation is the only alternative. Lesions located in other areas of the femur or tibia may also be amenable to this treatment approach. Patients who are very young or athletic may benefit greatly from this procedure from a functional standpoint, and this procedure may also serve to minimize the number of future surgeries needed. After tumor resection, vessels are usually repaired in an end-to-end fashion to optimize patency. The distal portion of the leg is rotated 180º and reattached to the thigh at the proximal edge of the resection. Other variations are also possible. [1, 29] The rotation allows the ankle to become a functional knee joint, so the length of the leg should be adjusted to match the contralateral knee. Ideally, before rotationplasty is embarked on, patients and families should either meet or review a video recording of a patient who has had the procedure. Metastatic lung nodules can be cured by means of complete surgical resection (most often wedge resection). Lobar resection or pneumonectomy may occasionally be required for clear margins. This procedure should be performed at the time of the primary tumor resection. Although bilateral nodules can be resected via a median sternotomy, surgical exposure is superior with a lateral thoracotomy. Therefore, bilateral thoracotomies are recommended for bilateral disease (each side separated by a few weeks). For an osteosarcoma that recurs as one or more lung lesions only more than 1 year after the patient is off therapy, surgical resection alone can be curative; the likelihood of metastases to other sites is low. Chemotherapy is warranted if recurrence occurs earlier; in such cases, the risk of other micrometastatic disease is high. Hearing loss is an adverse effect of cisplatin. Fever and neutropenia may occur, and if they do, patient admission is required for intravenous (IV) antibiotics and monitoring. Patients may require admission for a multitude of other medical problems during their chemotherapy treatment phase, including, but not limited to, varicella infection (for IV acyclovir and monitoring), mucositis (for narcotics), dehydration, meningitis, constipation, fungal pneumonia, and cystitis. Restrictions on activity vary with the location of the tumor and the type of surgical procedure required for treatment. As usual for any child with cancer, consultations should be made with an oncologist, as well as with any provider with a subspecialty related to the specific clinical circumstances. Social services, psychology, dentistry, and child life specialists are usually involved with these patients and their families throughout their treatment course. Further cycles of chemotherapy generally necessitate inpatient admission for administration and monitoring. Active drugs include methotrexate, cisplatin and doxorubicin. Patients treated with high-dose alkylating agents are at higher risk for myelodysplasia and leukemia. Therefore, a complete blood count (CBC) should be performed periodically. Patients with fever and neutropenia should be admitted for IV antibiotic therapy and monitoring. Admission is required perioperatively for local control (surgical resection, amputation), usually around week 10 of therapy. Resection of metastatic disease (eg, lung nodules) is typically performed at the end of therapy. Patients may require admission for a multitude of other medical problems during their chemotherapy treatment phase, including, but not limited to, varicella infection (for IV acyclovir and monitoring), mucositis (for narcotics), dehydration, meningitis, constipation, fungal pneumonia, and cystitis. For patients on granulocyte colony-stimulating factor (G-CSF) therapy, a CBC should be performed twice weekly so that G-CSF can be discontinued when the absolute neutrophil count has reached a predetermined level (usually 1000 or 5000/μL) (see the Absolute Neutrophil Count calculator). It is important to monitor the blood chemistries and liver function test results for patients on parenteral nutrition or who have a history of toxicity (especially if nephrotoxic or hepatotoxic antibiotics or other drugs are continued). To monitor for recurrence, patients should continue to have blood work and radiographic scans on an outpatient basis, with the frequency decreasing over time. Generally, these visits occur every 3 months for the first 2 years; every 4 months for year 4 and every 6 months for years 4 and 5 and yearly thereafter. When patients have been without therapy for 5 or more years, they are considered long-term survivors. These individuals should be seen annually in a late-effects clinic and monitored with appropriate studies depending on their therapy and side effects. Visits may include hormonal, psychosocial, cardiology, and neurologic evaluations.